Having a garden that regularly attracts hummingbirds is often an unexpected delight. Although hummingbirds may seem to choose their feeding grounds randomly, many actually feed along regularly followed routes, called traplinings, and become very territorial about their designated space. Other types of hummingbirds find a good feeding ground and make themselves at home, becoming residents. Some even switch back and forth between the two behaviors, depending on the competition for food. To make your garden hummingbird friendly, you need to choose plants that catch their eye and can provide food in a way they can access and use. So, which plants attract hummingbirds? 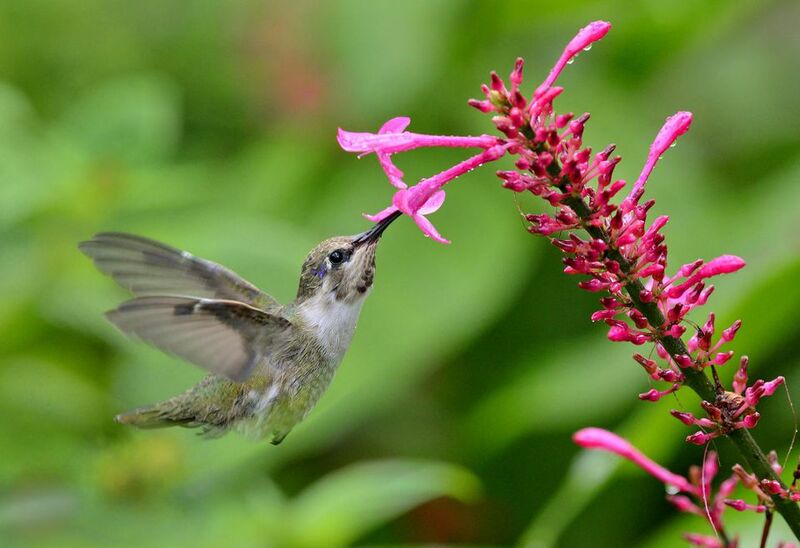 Nectar - Hummingbirds visit plants for food and they search for nectar-rich blossoms that allow them to fuel up. Nectar is a sugar-rich liquid produced by flowers. Birds and insects ingest it as food and, in the process, they help pollinate the plant. Color - Hummingbird feeders are usually red because hummingbirds can spot red at a great distance. Although they will feed on any nectar-rich flower, no matter the color, crimson red petals will catch their attention as they are flying by. You do not need to plant only red flowers, but having a few good sized patches of red will make it easier to attract hummingbirds. Tubular flowers - Hummingbirds' long pointed beaks are built for long tubular flowers, like larkspur, foxgloves, morning glories and salvia. Clusters - They also prefer flowers that bloom in clusters, like bee balm and Agastache, so they can dart and sip from one to another. Plants with only a couple of large flowers or gardens with only a few of each plants would require more work and energy expenditure to find enough nectar to eat their fill. Height - Since hummingbirds often feed while hovering in flight, flowers that are held above the foliage, like coral bells, or that dangle below and outside of it, like fuchsia, are the easiest for hummingbirds to access. Hummingbirds are tiny, but they have a high metabolism and require a great deal of food. They must eat more than their weight in food every day or they are in danger of starving. They like to take their food in meals, spaced throughout the day. They will eat a lot and then burn it off and eat some more. Smart creatures. Hummingbird feeders can provide a hummingbird banquet, but it is easier for them to spot and find a garden full of flowers and in the long run, more reliable. Do not use pesticides on your flowers. Besides hurting the hummingbirds directly, hummingbirds also feed on insects and can ingest whatever is sprayed on the plants that way. Vary the heights of your plants. Different species of hummingbirds have preferences for where they like to hover. Some like to remain close to the ground while others prefer grazing the top of the border. Have a good mix of flowers. Every gardener knows that flowers have good years and off years. Don't plant only one type of hummingbird flower. Have several backup varieties. Bold, bright colors, like red and orange, will attract hummingbirds, but make sure you have some flowers that continue blooming over a long period, like 4 O'Clocks and Impatiens. Include some trees or shrubs in your garden, so hummingbirds will have a place to rest. They actually do stop hovering from time to time and appreciate a perch near their food. Maybe choose flowering varieties, that offer both rest and food, like flowering quince and Weigela. Hummingbirds also need access to water. They will frequent shallow bird baths and even puddles, but what they really love is a gentle mist. If you have a fountain or a water feature with a water fall, expect to see them using it like a child running through a sprinkler. Here's a list of flowers that are hummingbird favorites.